We are a lively club with all year round racing and events and a busy training section, so there’s always something going on. The Welsh Harp (or officially Brent Reservoir) covers 100 acres, and is just under a mile in length, with the impressive backdrop of the Wembley Stadium arch. We have large car and dinghy parks and an excellent clubhouse, with changing facilities, hot showers and central heating. Hot food is available on Sundays all year round and Wednesday evenings between April and September. We also have a well stocked bar for you to relax in after sailing. 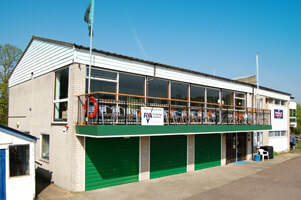 The New Members Club bridges the gap between the courses run by the Sailing School and club racing activities. It helps beginners and new members feel part of the club and meet other sailors. The sessions are aimed at adults with basic sailing skills (RYA Level 1) and uses the facilities, equipment and club boats belonging to WSC. Sessions are open to all WSC members and are free. All sessions will start with a briefing in the Committee Room, at 14:30 on Sundays and 19:00 on Thursdays.